The U.S. Postal Service agreed to change its policy that allowed union employees to take unpaid time off to engage in political activity after an independent investigation found the agency engaged in “systemic violations” of the Hatch Act that led to an “institutional bias” in favor of certain candidates. 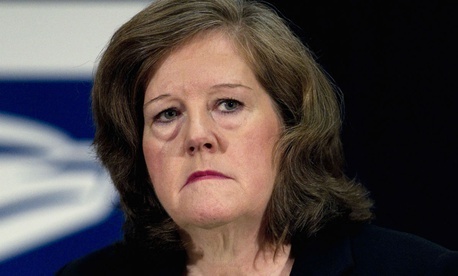 Postmaster General Megan Brennan announced the changes in a Senate Homeland Security and Governmental Affairs hearing Wednesday, which followed an inspector general’s report that brought the issue to light. That report found USPS spent $90,000 on overtime to cover for employees who took time off to campaign in advance of the 2016 election. The Office of Special Counsel followed up those findings with a report of its own—made public at Wednesday’s hearing—that the Postal Service’s actions had violated the Hatch Act, which bars federal employees from engaging in political activity in an official capacity. “We concluded that the USPS practice of facilitating and directing carrier releases for the union’s political activity and the use of union official leave without pay for such activity resulted in an institutional bias in favor of [the National Association of Letter Carrier’s] endorsed political candidates and that this violated the Hatch Act,” said Adam Miles, OSC’s acting special counsel. Facility and district managers grant postal workers leave without pay requests based on the needs of both the employee and the Postal Service, as well as potential costs to the agency. In the cases in question, the USPS headquarters labor relations manager of policies and programs flouted the standard procedures by directing local labor relations leaders to allow each of the 97 employees to take leave, according to the inspector general. Headquarters did not coordinate the leave requests with the proper staff to ensure that the employees taking off would not be disruptive to local operations. This amounted to “systemic violations” of the Hatch Act, Miles said, as USPS management was tacitly putting its thumb on the scale in favor of NALC’s preferred candidates. The IG had found the employees disproportionately took time off—about 82 percent of the cumulative 2,776 days—in political battleground states in which NALC had issued endorsements. Still, Miles added, OSC did not find any USPS official had helped identify employees to take or help any individual “achieve electoral success.” In addition to various Senate candidates, NALC endorsed Hillary Clinton for president. Sen. Ron Johnson, R-Wis., who chairs the committee, said the decision by OSC not to recommend discipline against any individual was head-scratching. USPS vowed to take immediate action to correct the Hatch Act violations, as directed by OSC. Going forward, USPS will no longer consider political activity part of official union business when approving leave without pay. It will also instruct managers to take a “hands-off approach” to a union’s political activity, so as to not create “institutional biases for certain candidates.” Brennan, who called OSC’s findings “damning,” said the Postal Service would implement those changes by Aug. 31. She also promised to expand communications related to the Hatch Act generally and to educate employees on the new policies. Fredric Rolando, president of NALC, which was not invited to Wednesday’s hearing, said that admission from OSC undermines the rest of its report. “We reject the OSC’s conclusions that the granting of [leave without pay] represents either a ‘systematic violation of the Hatch Act’ or an ‘institutional bias in favor of NALC’s endorsed political candidates,’” Rolando said.